Address: Avenida Maritima, 11, Valle Gran Rey (La Gomera), Islas Canarias. 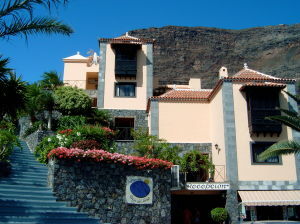 The Baja Del Secreto apartments in Valle Gran Rey, on La Gomera, have a swimming pool and free Wi-Fi. They are just a few metres from the beach. The Baja Del Secreto apartments are in typical Canarian style, with wooden balconies and stone walls. They also have large terraces, most of them with side sea views. All apartments have satellite TV and a kitchenette with hob and fridge. The Baja Del Secreto complex has a tour desk and can arrange bicycle hire, as well as diving and hiking trips. Valle Gran Rey, a quiet fishing village, is located at the mouth of a gorge. It has a sandy beach.